Sports Car Review: If you're looking for, say, a mid-size luxury car, you'll find a Cadillac CTS, BMW 5-Series, Mercedes E-Class and the Lexus ES that are all basically the same thing. Sure, there will be differences in their prices, performance and gizmos, but the overall driving experience is rather predictable. Get behind the wheel of a 'Vette, though, and you'll soon realize there's absolutely no other car like this on the planet. It's a blue-collar SuperCar. Its engine is like a killer dump truck from hell. Blip the throttle, and it sounds like God hocking a loogie. It's the raw, raucous, nasty, wonderful sound of 430 horsepower belching out the exhaust pipes, emitting one of the most frightening melodies in the automotive world. Combine all that power with a featherweight body, skateboard suspension, go-kart steering and jumbo-jet tires, and you've got a vehicle like absolutely no other on the road. That's the mystique of the Corvette. You can find faster cars than this $47,000 Chevy, but they usually cost twice as much. You can also find cars that are more refined, and certainly more comfortable. But really, why would you want to? Few sports cars test the limits of your driving skills like this one. Normally I enjoy turning off the traction control on cars I test to see what the limitations of the vehicle are. But when I turned off the traction control on the Vette, I quickly realized the car's limits are far higher than my own as a driver. In fact, I bet there are only a handful of drivers on the planet, all of them highly paid professionals, who can really, truly discover the limits of this great car. That means giving a Corvette to an ordinary driver is akin to giving a Stradivarius to a beginning violin student. It's impossible to appreciate how much better the tool is than the performer. And really, it only has one downside. This car, the Stradivarius of American sports cars, has an interior splattered with the same plastic you'd find on a cheap Chinese stereo in the clearance aisle at Wal-Mart. It's a shame, really. The soft, beautifully stitched panels on the dash are placed right next to a center console that has the same plastic texture as a bargain-bin trash can. It's kinda disgusting. To prove my point: When you're at the Chevy dealer, sit inside the awesome new Malibu before checking out the Corvette. Then watch the salesman squirm when you ask him why the $47,000 'Vette doesn't have nearly as nice an interior as the $20,000 Malibu. Of course, you'll end up buying the Corvette anyway because it's an automotive Icon. And you can look over pretty much any fault when you hear the way it rumbles, shakes and snarls from the very instant you turn the key. And from there, it only gets better. What was tested? 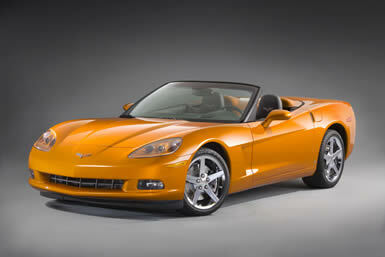 The 2008 Chevrolet Corvette Convertible 3LT with a base price of $60,525. Options on the test car: Magnetic selective ride control $1,995, automatic transmission $1,250, navigation system $1,750, polished 18-inch wheels $1,295. Total MSRP Price as tested: $66,815. Why avoid it? General Motors knows how to make a much, much better interior than this. Cheap plastics in the interior are the only downside to this classic American sports car. Why buy it? There's no other car like the Chevrolet Corvette, a raucous sports car with 430 horsepower and a lightweight, fiberglass body. It's a blue-collar SuperCar, offering exotic performance at a relatively attainable price.